Some of Maine's most outstanding natural features and secluded locations are found on Maine's Public Lands. The more than half million acres are managed for a variety of resource values including recreation, wildlife, and timber. Camping - the Backcountry Camping page highlights several locations. For winter camping call the Public Lands Region Office that corresponds to your destination as seen on this map (PDF 431KB). Primitive tent camping only: no amenities or plowed locations; winter camping experience and self-sufficiency a must. If you do not have advanced winter camping experience please consider honing your skills at the select Maine State Parks that offer winter camping. Search for additional activities at our Find Parks & Lands search page. For a rugged, backcountry experience in a remote setting on Public Lands ranging from 500 to 43,000-plus acres. Plan your trip by visiting our search page and view the Your Maine Lands brochure (PDF 3MB). Our Mini Guide (PDF 112KB) includes public lands too. Individual brochures are available on the Publications and Maps page. Know your limits and abilities and those of your group. Public Lands are not staffed like Maine State Parks. Cell phone service is not reliable on many of the Public Lands. Yield the right-of-way to logging trucks at all times. Rules of the public lands for review before your visit. Lean more about specific locations by using the search page. Unpaved private roads provide access to many of these primitive recreation areas. Access is a privilege not a right; please respect the landowner's property. 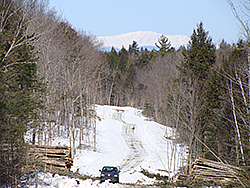 In a few instances such as inside the North Maine Woods, Public Lands are managed in cooperation with neighboring landowners and fees are collected. Multiple-uses are managed under a "dominant use" system which ensures that sensitive resources such as rare plants and backcountry recreation areas are not disturbed by more intensive management activities. Scientifically-based timber harvests support land management activities and are planned in coordination with recreation, wildlife, forest health, and scenic considerations. Revenues from certified sustainable forestry timber sales help to pay for trails, campsites, roads and other infrastructure, and wildlife management projects. Harvesting is conducted by private contractors under the supervision of Public Lands Foresters. Call the Bureau of Parks and Lands main office, (207) 287-4960, to be directed to the appropriate Region Office.